Doi Maach is a very unique dish with very little spices and the flavor of the fish is the star of the dish. “Doi” is Yogurt or Curds and “Maach” is Fish and the mix of the two is just right and a perfect blend. 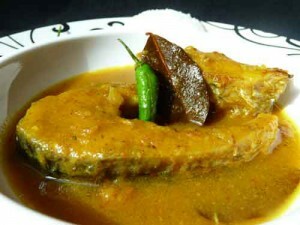 Rohu is an everyday fish in a Bengal and to get the authentic flavor, that is the best fish to use. Sometimes, it’s hard to find Rohu, here are some of the options: Red Snapper, Halibut, Cod, Haddock, Swordfish. You can use steaks or cut fillets into bite size pieces, it still tastes great. Sprinkle ¼ tsp of Turmeric and ¼ tsp of Salt and rub on the Fish. Set the fish aside and allow it to marinate for 5-10 minutes. Meanwhile, make a paste of the Onion and set aside. In a mortar and pestle, pound the Cardamom and the Cloves, discard the Cardamom skin. Set aside. In a pan, heat the Oil and lightly fry the fish on both sides, pull aside on a paper towel till ready to use. In the same. remaining Oil, add in the Bay Leaves, Ground Cloves & Cardamom, Onion Paste, Green Chilies, ¼ tsp Salt. Add in Ginger, Turmeric Powder, Red Chili Powder, Sugar and mix. Smooth the Yogurt with 2 tbsp of water, turn the flame off and slowly add the Yogurt to the pan, while stirring continuously. Once mixed in, turn the flame back on and add in the Raisins. Cook till the Oil separates from the mixture. Once done, add in the Fish gently. Cook on both sides for a couple of minutes. Add in the Warm Water (2 cups) and mix very gently to mix the masala to the Water. Once mixed in, lower flame, cover and cook for 10 minutes. After 10 minutes, uncover, increase the heat to a high and cook for another 5-7 minutes. Cook till the gravy becomes thick to serve with Rice or Chapati.